Last Thursday we organized our second schoolyard workshop at Blågård Skole as a part of the school project we are conducting for the occasion of the 50th anniversary of Statens Kunstfond. Again, these workshops have an aim of engaging young students in design of urban spaces based on a user-driven approach though an interactive analysis of their schoolyard, which includes plan discussion, prototype construction and collage making. This time around the on-site workshop was done with three groups of 7th graders who expressed their ideas on how to create a new identity of their schoolyard as a place of socializing and learning while including other users. Jeanette’s group emphasized the need to define the area of the schoolyard as a students’ space by establishing spatial connection between Indskolingen and Udskolingen building (Primary and Middle School). Interestingly, even though this was a female group, their main idea was to create a football court in front of the entrance with an additional seating structure. The group used the duct tape to frame the football court and soda crates to build seating furniture. In this way, they created a place that combines activity and socializing while demanding more gender inclusiveness. 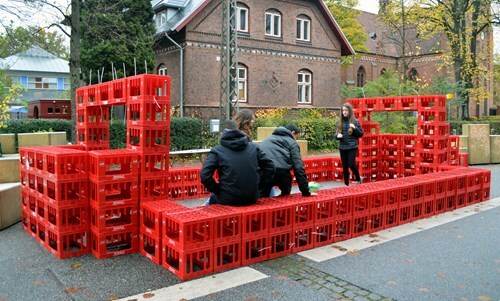 Furthermore, this group addressed the way other users utilize the space of the schoolyard. They decided to delineate the pedestrian path with a seating structure and they suggested coloring the entire schoolyard ground in order to slow down the bike traffic and diminish the dominance of bikers in the street. They suggested a blue color as a symbol of the school in order to make the schoolyard more prominent. Rasmus worked with a mixed group which enthusiastically embraced the role of decision makers in their schoolyard and made three prototype proposals. Firstly, they also created a football court for two players addressing the need for more active usage of the schoolyard. Afterwards they built a circular seating structure that would serve as an outdoor classroom and as an example of a different teaching setting. 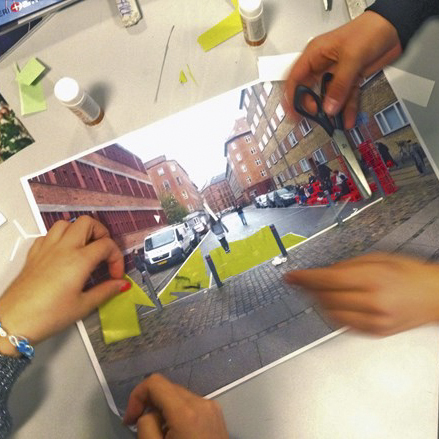 In the end, students emphasized the need to establish a user hierarchy in which other users would acknowledge the schoolyard as a students’ space. In this sense they expressed the lack of a divider by creating a long bench which could serve as a barrier and provide more seating. Finally, Michelle’s group focused on urban furniture and discussed how to elevate the schoolyard in order to establish a new perspective within the area. Their main idea was to create a green rooftop which would incorporate pedestrians and cyclists which could pass underneath or use the rooftop as well. They also addressed the need for more seating while using the existing urban setting with benches built onto the walls of surrounding building.